In response to mounting concerns about the cost of college, lawmakers and presidential aspirants have proposed major new partnerships between the federal government and states to tackle college affordability. 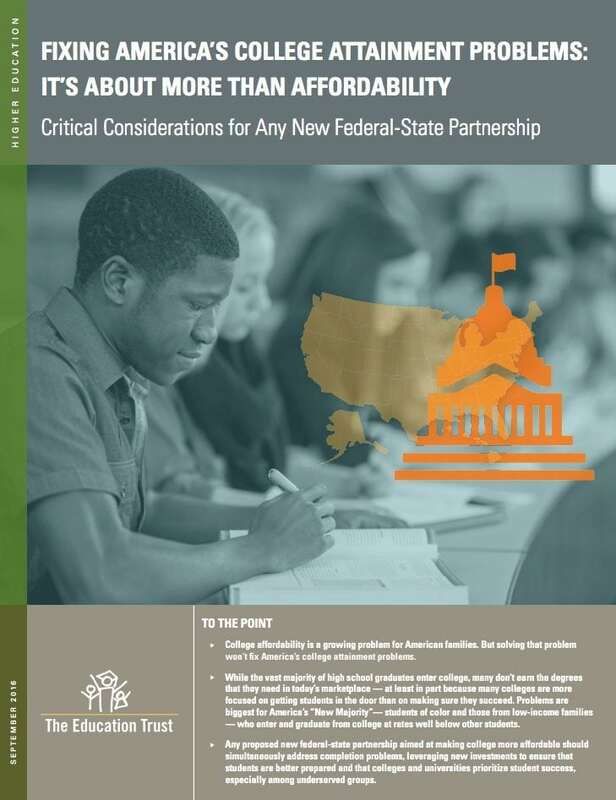 In “Fixing America’s College Attainment Problems: It’s About More Than Affordability,” Ed Trust maintains that any new federal-state proposal aimed at making college more affordable must also simultaneously address completion problems by leveraging new investments to ensure that incoming students are better prepared, and making sure that colleges and universities prioritize student success, especially among historically underserved groups of students. The report makes it clear that our nation needs not just more access to college but more college graduates, and each level of government has a role in getting that job done.